Can you all believe it's DECEMBER? I still remember sitting down at the beginning of the year, listing out all of my goals and resolutions for the year. I'll have to find that and see if I was successful at all (who knows!). 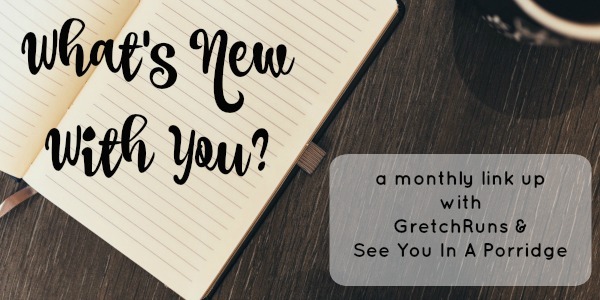 The end of the year is going to be super busy with some fun stuff coming up that I can't wait to talk about, so today's post will be short and sweet! Make sure you join the monthly linkup with Kristen and me by linking up below! Now let's see what's new with me! Stay Active. I started training for another marathon this month, so I've definitely been really active. The first few weeks have been great, with a little sidelining because of travel and holidays. I figure that it's better to get these bad weeks out of the way earlier, and really nail the training at the end! Drink Beer! I haven't tried out any new breweries this month, but I did join the Pittsburgh Winery Wine Club! I've been going here for a bit with my sister and her husband, and we decided to bite the bullet and join the club. Included in the membership is special deliveries of wine every 6 months, free tastings every time you visit, discounted bottles, and special club events. In November, we all went to the winery's 10th birthday celebration, which featured amazing food, wine (of course) and a make-your-own-red-blend station. It was great! I'd love to do something like class pass, I don't think it exists here but I live in hope of something similar arising. I love how active and driven you are! Both the class pass AND the wine club sound right up my alley. We have a lot of wineries here but we've never actually joined one. If I knew they had fun social events like yours I might be more inclined to do so! Great stuff with your training, SO FANTASTIC! No, I cannot believe it's December already. This fall has flown by! Good job on staying active and training for another marathon. You rock! Fall flew! How is it December? i seriously can't believe it's december already. i mean, i *can* but seriously. SERIOUSLY. that winery club sounds pretty fancy! make your own red blend? fun! The coldness helps me believe it is December, as does my burgeoning belly!